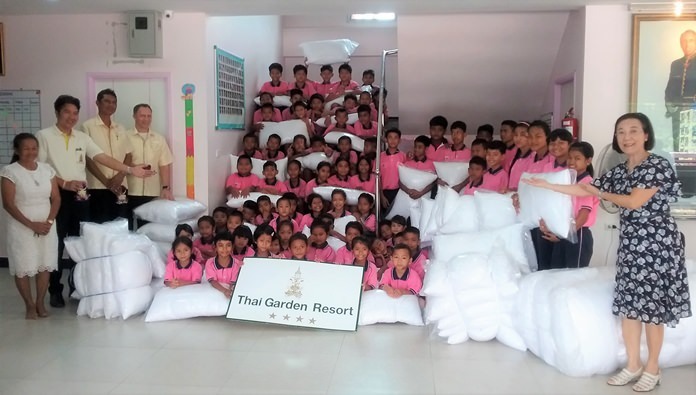 The Thai Garden Resort donated 150 pillows to children under the care of the Human Help Network Foundation to soften both beds and the charity’s expenses line. Hotel General Manager Danilo Becker, Executive Assistant Manager Sanich, and Director of Sales Panom Anuan presented the pillows to HHN Director Radchada Chomjinda for kids at the foundation’s Drop-In Center, CPDC, and ASEAN Education Center March 28. The donation was delivered on behalf of the owner of the Thai Garden Resort Gerrit Niehaus and all employees. Becker said the hotel understands the young children need daily naps and wants them to sleep with good and hygienic bedding. The Thai Garden Resort is well known for their annual fund-raising “Toy for Joy” where the hotel collects donations over the festive season for students from a school outside of Pattaya. They are committed to support the HHN and do what they can to lighten their expense load. 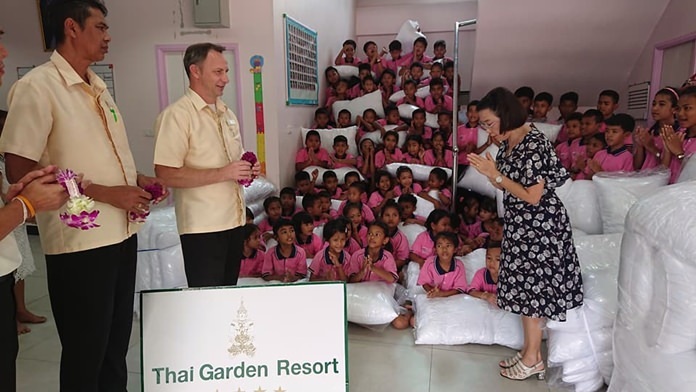 The children and Radchada Chomjinda say thank you to Thai Garden Resort GM Danilo Becker, Executive Assistant Manager Sanich, and Director of Sales Panom Anuan.